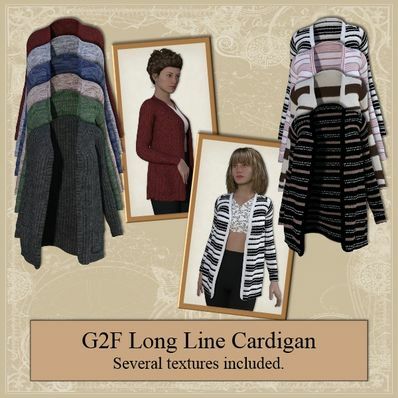 A Long Line Cardigan for Genesis 2 Female for use in Daz Studio 4.8. Very nice design. Lovely textures to match the design. Thanks Wendy. I see that you are preparing G2Fs for the forthcoming Northern Winter. We, in the Southern Hemisphere are looking forward to our Summer season now........ Thanks for creating & sharing these unique clothing items, including textures as well. Beautiful Thank you very much. THX a lot for sharing, it's beautiful. So lovely and stylish. Love the textures, the solid and stripes, so perfect! Fabulous, Thank You! Thank you, Wendy! I love it! Always love to see Wilmaps Digital Creations in my inbox :) Love it, thanks! Thank you so much - fine work! Looks great, comfy! Needs more warm clothes. THANKS! Thank a lot it is a must. Lots of uses for this one! And thank you for continuing to support G2F!! This is so great. I love to see real world clothes like this. Possible to do another with a lapel? Wonderful model, wonderful textures. I missed such a cardigan! Thank you very much! A nice addition to G2F's clothes. Thank you.